I was on the treadmill today watching an episode of Star Trek: The Next Generation (for some reason, I am on a mission to watch them all, in order) and Captain Picard referred to his "superiors." I had a thought at that moment that liberated me from the chains of equality. Of course, Americans have the idea ingrained in them that "all men are created equal." This fuels a kind of independent spirit (no pun intended) and a sense that we are just as good as anyone around us. Those who think they are "better" than us can sod off. On an existence level, this is true... No one is simply born with more worth than anyone else. As a teenager and as a young adult, I was fiercely against regarding anyone as a "superior." I have always been a bit snippy about that idea. I would never have joined the military, because I have a problem with playing the role of a subordinate. After all, I, as a private, I am every bit as good as the drill instructor, am I not? Am I not as good a person as him? Am I not as valid of a human being? Why should I call him sir? In the end, I do not think a Colonel is a superior person to a Private. But I do think he, within his organization, has reached a level worthy of respect and deference. 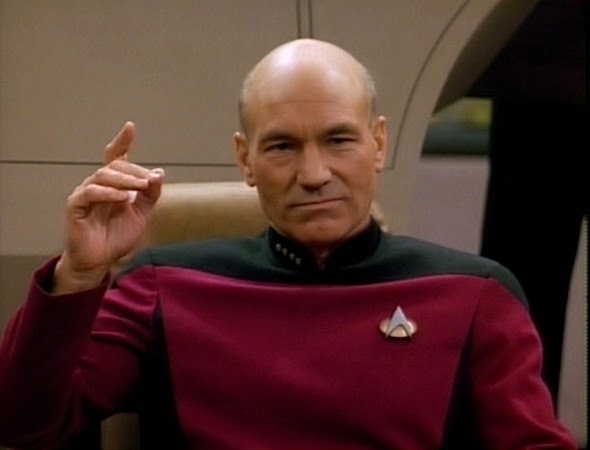 Picard is a star ship captain in the show. He has reached great heights, but not as high as his commanding admiral. To refer to the admiral as his "superior" is not as metaphoric as a rebel soul like mine would always see it. For the organization to work, one can, with sustained dignity, throw off the chains of ego and bow to one's superior. I only address the Prince of Wales as "Sir". I imagine "Charlie" or "Chuck" would be a tad less formal than he is used to.